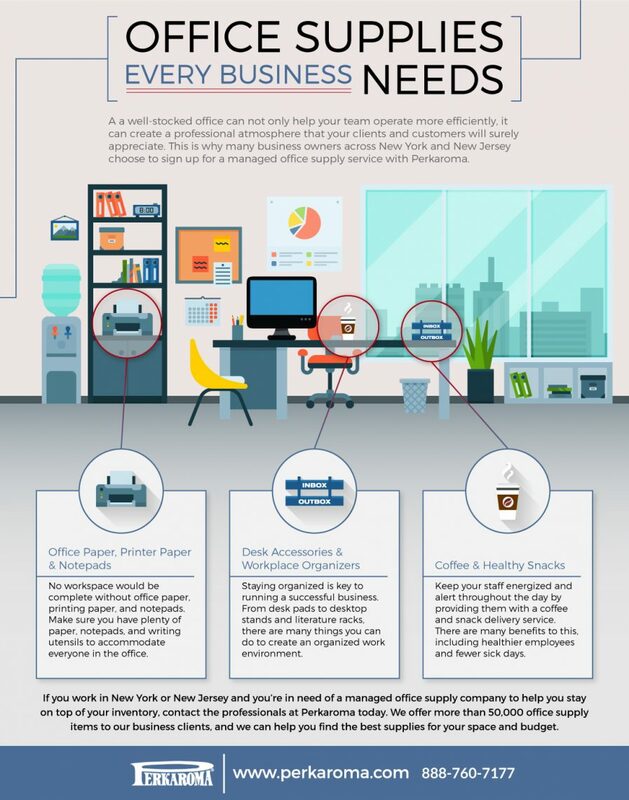 In order for your office to run efficiently, it’s important to have the office supplies you need on-hand. As a leader in office supply delivery across New York & New Jersey, Perkaroma is your go-to partner for paper products, writing supplies, folders, ink, toner, and more. Office supplies are the lifeblood of any business, regardless of the industry you work in. It’s critical for businesses of all sizes to stock up on office supplies because if you run out of printer paper at one-o’clock on a Tuesday, the office workflow will be negatively affected. Not only will you have to run to a local office supply store to pick up more paper, you’ll waste time and energy in the process which can result in a loss of potential earnings and sales. This is why many business owners across New York and New Jersey choose to sign up for a managed office supply service with Perkaroma. From automatic restocking to automatic reordering programs, Perkaroma is your go-to partner in office supplies, breakroom supplies, shipping supplies, cleaning supplies, premium coffee services, and office snack services. As you may already know, a well-stocked office can not only help your team operate more efficiently, it can create a professional atmosphere that your clients and customers will surely appreciate. The last thing you want to do is prepare for a big client meeting only to realize the office printer has run out of ink or the projector’s batteries have died at the last minute. Unless you have the necessary office supplies on-hand, you could miss out on a potential sale due to unpreparedness. Luckily, when you sign up for one of Perkaroma’s automatic restocking or reordering programs, you’ll never have to worry about running out of office supplies at a critical time again. Duracell AA Procell Alkaline Batteries deliver outstanding performance and reliability for all of your office needs. Perfect for remotes, flashlights, clocks, and other electronics, these batteries are proudly made in the USA. 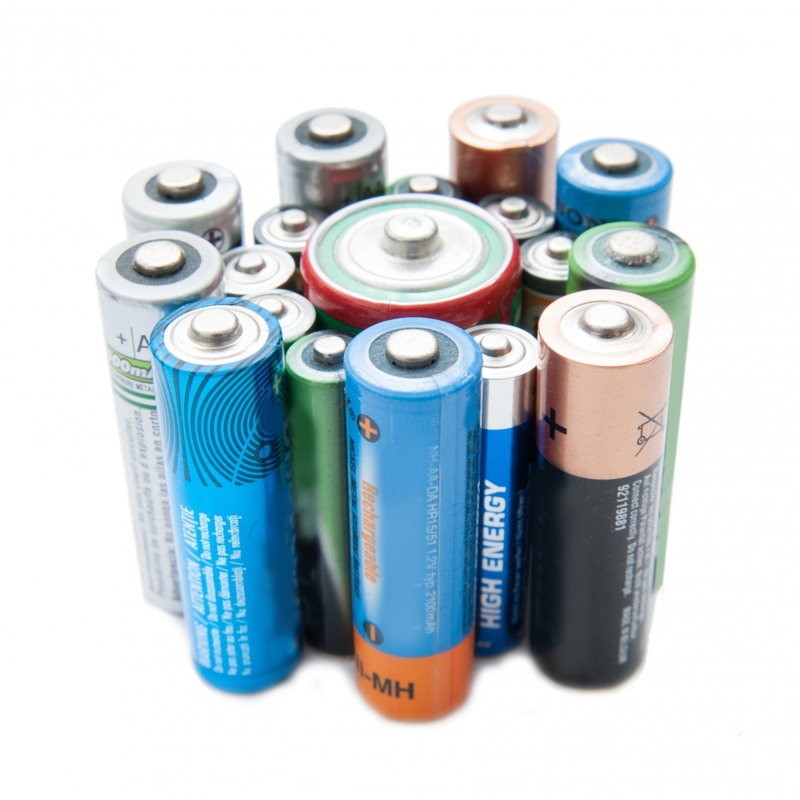 Each battery us date-coded for effective inventory management, and guaranteed fresh for seven years. If you need long-lasting and reliable D batteries for the electrical devices in your office space, look no further than Duracell® CopperTop Alkaline D Batteries. You can take comfort in the Duralock Power Preserve Technology in these batteries, giving you a 10-year guarantee in storage. As the #1 trusted brand of parents, pharmacists, and first responders, Duracell is a battery you can trust. Staying organized is key to running a successful business. At Perkaroma, we carry an extensive selection of desk accessories and workplace organizers to keep your office space tidy. From desk pads to desktop stands and literature racks, we can help you create a space that your employees are sure to love. Let’s be honest: no office is complete with Post-it notes. Our Post-it Flag Value Pack comes in assorted, eye-catching colors for both marking and color-coding work documents. Due to their strong adhesive, you don’t have to worry about these flags falling off while your combing through work documents or organizing your calendar. Desk clutter can slow down your work day. 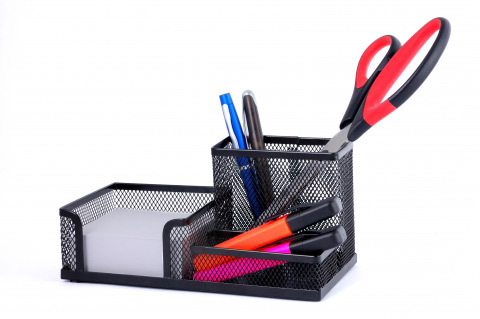 Fight back with the Universal Mesh Desk Organizer. This organizer has everything you could ever want in a desk storage unit. Complete with a cup bin, dividers for pad and folder storage, and a couple compartments for pens and pencils, you can manage workspace clutter with this trendy desk organizer. Healthy employees are happy employees. Our Adjustable Height Monitor Stand offers a contemporary design that can be adjusted to ensure correct ergonomic positioning. Ideal for laptops, printers, and computer monitors up to 80 pounds in weight, this monitor stand also has 11 inches of storage space underneath it to further maximize your desk space. When it comes to high-quality files, folders, and storage box files, you can trust Perkaroma to provide you with the best options at the most affordable cost. From small startups to Fortune 500 corporations, all businesses need files and folders to stay up-to-date with client information and operations. Made from a special formula to prevent against paper cuts, put an end to misfiling hassles with our Pendaflex CutLess File Folders. These decorative file folders feature a light interior shade, and this bulk pack consists of 100 high-quality folders. Another perk of these file folders is that they can protect your important work documents from accidental spills, as they offer a unique WaterShed technology. Wallspace is often overlooked, but with the Smead Cascading wall Organizer, you can save precious storage space while keeping organized at the same time. Featuring six cascading pockets (that are each removable for easy viewing access), each colored pocket can hold up to 25 sheets of paper. No workspace would be complete without office paper, printing paper, and notepads. As a business owner, you probably have letterheads, envelopes, and notepads with your business name and logo on them. You also probably have an office supply closet that is full of office essentials like pens, pencils, calculators, ink cartridges, and the like. If you’re shopping for white copy paper that is perfect for everyday office-copier use, order our Universal White Copy Paper today. This acid-free paper was made from wood that came from a certified managed forest, and is great to use for printing training documents, copying employee driver’s licenses, and much more. Do you take notes throughout the workday? If so, you may want to consider ordering some Universal Wirebound Memo Books for your office. These memo books feature a durable and flexible cover with white paper for quick note and memo taking. The single-coil binding makes these books easy to open and close. Consider handing these out to your employees before a big meeting or presentation so they can take notes and jot down any questions they may have. In order for your employees to stay timely and on-task, you may want to invest in some office calendars and planners for your company. These items can come in handy when it comes to scheduling meetings and creating reasonable deadlines for projects. The Brownline Monthly Desktop Calendar is a must-have for your desk. With bold and easy-to-read dates, you’ll easily be able to view upcoming business trips and meetings as soon as you sit down at your desk. Each page features a new month with one block per day to write down notes and upcoming appointments. The At-A-Glance Monthly Planner is made from premium paper to resist annoying ink bleed. The perfect monthly planner for big-picture planning, each month has a two-page spread with past, current, and future months to reference. There is also a perforated memo section to easily tear out any notes you need to take with you on-the-go. Many businesses throughout New York and New Jersey rely on envelopes, mailers, and shipping supplies to operate. Whether you’re company makes eco-friendly shoes for kids or you’re in the business of reselling vintage collectors items online, having the shipping supplies you need, when you need it, can make all the difference in your operation. Protect important work documents with our Universal Kraft Clasp Envelopes. As a durable and heavyweight option, these high-quality envelopes will protect against rips and tears. Featuring a reinforced eyelet with a two-prong clasp, these office envelopes have a gummed flap for a secure seal. With the Universal Peel Seal Strip Security Envelope, you can send business letters and employee checks with ease. These envelopes do not require moisture to seal like traditional envelopes. All you have to do is peel back the strip and fold the flap closed for a safe and secure seal. Whether you need to ship fine china or electronics, it’s important to ensure you have the packing materials needed to protect your product on the road. The Sealed Air Bubble Wrap Cushioning Material is designed to protect your shipment from damages. With this lightweight packing material, you can reduce shipping costs while also keeping your valuables protected, no matter where they go. When you print out an important document, it’s important to ensure that your critical business information doesn’t get in the wrong hands. By throwing out things like healthcare benefit papers and employee agreements, you’re opening your business up for security risks. For this reason, it’s always wise to invest in a quality paper shredder or two for your office. Looking for a paper shredder that will automatically shred stacks of paper with wrinkles, staples, and even paper clips? You’ll love the Fellowes® AutoMax 350C Auto Feed Shredder! All you have to do is load the drawer, press start, and walk away. This shredder can shred up to 350 sheets of paper automatically, and with the help of SilentShred™, you’ll barely hear this machine working. It can also safely shred items like credit cards, glossy paper, and CDs. The Swingline Stack-and-Shred Paper Shredder comes in a value pack that includes the shredder, 25 plastic shredder bags, and a three-year warranty. This paper shredder can automatically shred a stack of 130 letter-size sheets without the need to manually feed each piece of paper. The interior of your office can say a lot about your workplace. If your office is bland and boring, it’s going to be difficult trying to attract new talent. If your office is colorful and exciting, on the other hand, you’ll have far more people lining up to see what your business is all about. At Perkaroma, we can help you attract the hardworking employees you need by providing you with fun and affordable office decorations and art supplies. With the right materials, it’s easier than ever to dress up your workplace to create an inviting atmosphere. For professionals who work in education or with young children, it’s always wise to have colorful construction paper on-site. Our Pacon Riverside Construction Paper is heavyweight, acid-free, and perfect for all-purpose classroom art projects. As the only heavyweight groundwood construction paper made of 100% recycled content, you can feel good about ordering this construction paper for the workplace. If your employees are constantly looking for that one pair of scissors, it may be time to order more. Our Scotch Multi-Purpose Scissors are great for demanding cutting projects at work. With a soft grip handle for easy use, these scissors are made of corrosion-resistant stainless steel blades to ensure you can use them for years to come. At Perkaroma, we believe that the right breakroom supplies can go a long way toward energizing and inspiring your employees. From premium coffee services to snack delivery services, there are plenty of ways to keep your staff happy and healthy. When it comes to stocking your breakroom, consider the essentials below. When it comes to finding an office supply company that meets your needs, it’s important to do your research. Office supplies and breakroom supplies can be a big expense for your business, so you don’t want to overpay on paper, pens, and other office essentials. To make the process a little easier, we’ve compiled a list of questions to ask before you settle on a company to assist you. Do They Offer A Large Selection of Products? Before you sign off on the first office supply company you meet with, make sure that they offer the products and services you are looking for. Check out each company’s website to get a feel for their catalogue and list of office supplies. You’ll also want to look into the various brands of supplies being sold, because there’s a good chance you have your favorites. The more variety, the better. At Perkaroma, we offer over 50,000 types of office supplies at an affordable price to meet your needs, with some of the best name brands including Avery®, Smead®, and Universal®. Do They Offer An Easy Web Ordering Experience? In today’s day in age, if you don’t have a good website, you’re going to lose out on a plethora of business. The same goes for office supply companies. If you come across a company that has a clunky website that is hard to maneuver and navigate around, you may want to keep looking. The online ordering experience is important to your customer experience, and if you have trouble ordering office toiletries and utensils online, it can be extremely frustrating. When you partner with Perkaroma for your office and breakroom supply needs, you can rest assured that our online ordering portal is user-friendly and easy to use. You have the ability to browse our office and breakroom products by category, and we’re always offering web specials for our New York and New Jersey clients. With more than 50 years of professional experience in the office supply and breakroom restocking industry, Perkaroma is dedicated to making your office supply ordering experience stress-free and easy. 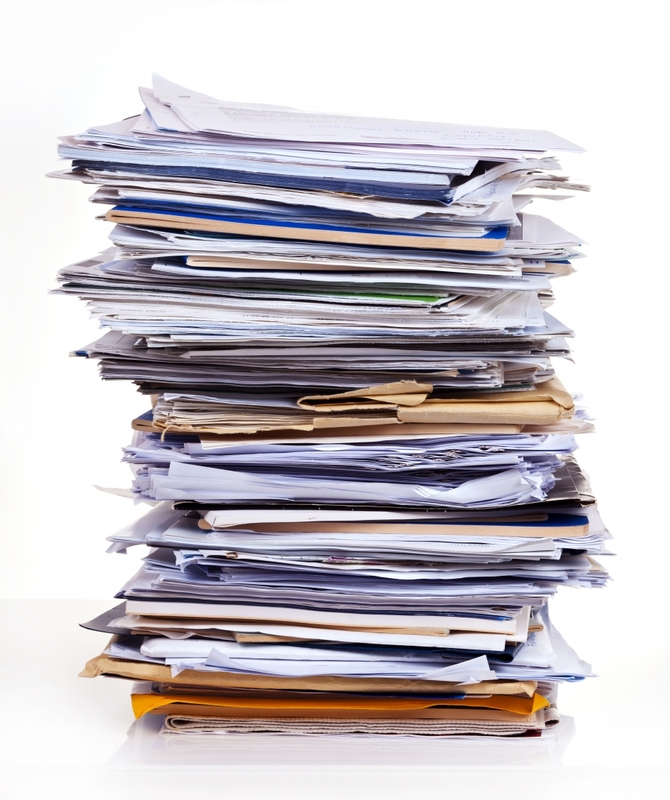 We understand the hassle that often accompanies ordering, reordering, and maintaining the inventory of your office. That’s why we offer comprehensive supply management services so you can focus on what’s really important: your business. When you sign up for one of our automatic restocking programs, you’ll be give a dedicated tablet with a proprietary software that you can use in your office to assist with reordering. You and your employees will be able to use the tablet or a cell phone app to scan the products that you’re running low on. This will send an alert to our software to automatically reorder computer paper, staplers, paper pads, or whatever else you may need. When replenishment is necessary, one of our Perkaroma associates will come to your office and replenish your breakroom or office supply closet, saving you valuable time during the busy work day. We also offer equipment maintenance and cleaning when you need it at no additional cost to qualifying clients. If you prefer to restock your breakroom or office supply closet on your own, you have the option of signing up for one of our automatic reordering programs. We offer our New York and New Jersey business clients some of the best technology to make the reordering process easier than ever. With our proprietary app, you’ll have the ability to reorder your paper, binders, files, staplers, and tape with the touch of a button from a tablet or smartphone. The best part about this service is that it is completely free to our clients and it does not require a minimum purchase threshold. If you work in New York or New Jersey and you’re in need of a managed office supply company to help you stay on top of your inventory, contact the professionals at Perkaroma today. We offer more than 50,000 office supply items to our business clients, and we can help you find the best supplies for your space and budget. 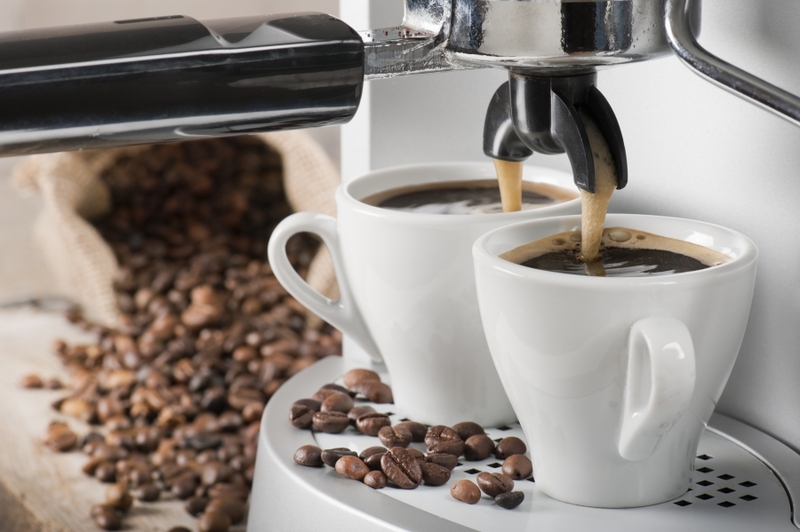 From premium coffee services to breakroom supplies, cleaning supplies, and shipping supplies, we’ve got everything you need to keep your business running smoothly.